What Gary and Rachel have cannot be manufactured. You’ll never find the British-expats who have come to Melbourne via Perth selling goods of which they cannot detail in-depth. 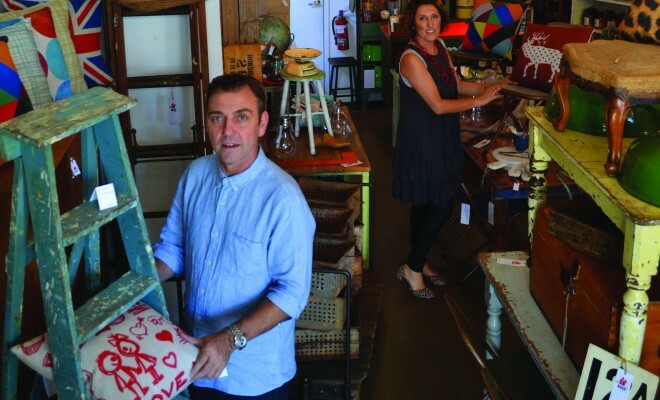 The history, the significance and quality of craftsmanship that underpins an item in the vintage goods store can routinely be listed off-the-cuff by this couple. Gary and Rachel represent one side of the coin in a furniture and goods industry that is facing a growing challenge to the ‘ways of old’ by replica furniture salespeople. The existence of ‘new’ enthusiasts for old goods is becoming more common in modern commerce, as evidenced by the current debate surrounding replica furniture in Australia and the wider international market. With copyright laws difficult to enforce internationally – combined with the rise of globalisation and online shopping – the idea of furniture pieces being unique, distinct and one-off is being challenged. For Rachel, the issues within the industry are clear. “Replicas are everywhere and it’s an insult to the second hand industry”, she said. Having opened Nook’s first store at 258 Johnston St in January 2010 – and established a warehouse in North Fitzroy during 2012 – the couple crossed over the Yarra and opened their East St Kilda store in November 2013. This has been done not because it is simply the most straightforward way to sell – for indeed in the age of Ebay they compete with folks who operate out of a garage office and have far less overhead – but they have expanded because they are committed to quality goods. “To a trained eye the differences in quality and workmanship between an original and replica piece is almost always huge”, said Rachel. These issues are ones also identified by Patrizia Torelli, CEO of the Australian Furniture Association. “There are no controls over the materials used in the production of these replica products, for example a recent incident came to light where the replica furniture was made from cancer causing material” Ms Torreli said. Ms Torelli also holds concern for the impact replica furniture may have on the wider industry. “The introduction of replicas in the marketplace can damage the public image” Ms Torelli said. On the other side of the debate, Rowan Watson of Matt Blatt Furniture feels the industry is not one of opposition or unfair competition, but rather of providing options. Mr Watson, a sales rep at the well-known replica furniture maker, Matt Blatt Furniture – whose pieces have featured on the TV show The Block – also feels that those who advocate for an original-only marketplace fail to fairly consider economy and necessity of pieces. In sum, the place of replicas in the furniture industry is one both sides of the debate shall fight hard for. From Melbourne all the way to Milan and other cities famed for their design, the issue is one in chief of authenticity versus accessibility. A chief issue in the world of business. Article first appeared in St Kilda News.